A pump is usually installed into a hole or pit in the floor, which is located in the basement, but unlike using a sewage pump, the pit isn’t airtight. 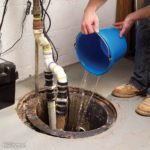 A sump pump is usually installed in a home or business during the beginning stages of construction, which also uses drainage tiles that direct the flow of water into the pit and uses a floater to active the pump, that will then discharge the wastewater somewhere outside away from your property. A sump pump can be especially useful if your home or business collects a large amount of groundwater, but depending on the size of your building it may require installing a second pump. A sewage pump, which is often referred to as an ejector pump is installed inside a holding tank, which usually also consists of a backup pump, and a control system. The way it works is similar to a sump pump, which is once the tank reaches its capacity; the floater will activate the pump, which will then pump the excess waste into the drainage system or a separate holding tank. Waking up to the smell of backed up sewage is a home owner’s worst nightmare, which is usually what happens if your sewage pump malfunctions. Fixing your sewer pump is a job that requires a proper understanding of how your sewer pump works, and should only be performed by professionals, who have years of experience repairing and replacing sewage pumps. There are a number of reasons that cause pumps to malfunction, sewage pump usually malfunctions due to loose bearings or some sort of leakage. The repairman will first make sure your packing gland is adjusted properly, but also loosely fastened just enough to allow 10 droplets of water to drip out every minute or so, which will help serve as a coolant. If the shaft is packed too tightly, it may need to be adjusted or repacked properly. The repairman will also make sure the bearings are properly lubricated, which will not only help prevent friction, but it also reduces grim and dirt from building up around the bearing.